I was talking to my sister today. She’s in that wonderful awe, we call…falling in love. She spoke in sighs and bated breaths about the man who has captured her heart and thoughts. Listening to her, I truly am convinced (as if I wasn’t before) about how much of an impact the “little things” have on a relationship’s dichotomy. For instance…she said she was speaking aloud…almost rhetorically. She’d mentioned how she wanted something sweet. Without thinking twice…her paramour left and returned with a brownie. He does this with almost everything. He remembers her likes and dislikes and is attentive with what he’s discovered about her. She too, responds in like kind. Even though she knows he’s trying to quit smoking…one day after expressing his irritability with his day, he mentioned wishing he could get a cigarette and some coffee. Being that they work in the same hospital, she went and found him a cigarette and a cup of coffee and brought it to the building he was in. It’s the little things. She said that he would go without…not eat, rather than see her suffer. He thinks of her first…himself second. That says something about his character as a man, that before he’d see her go hungry or without money…he’d sacrifice his own comfort to see to it that she had what she needed. When she’s upset, he lets her…he doesn’t attempt to fix it. He allows her the moment in which she needs to gather herself and find her calm. He’s there if she wants to talk…but not to try and be her hero. That is what some people don’t get. There are times when a person just needs to be understood, accepted and left to be an individual. He also knows when to shed optimism and not just WHEN, but HOW. He’s learned her in the few months they’ve been involved enough to see how her personality is. She too, knows how to allay his worries and support his needs. They’re open and communicative. Gentle and considerate. Loving and nurturing. Stronger together than apart. 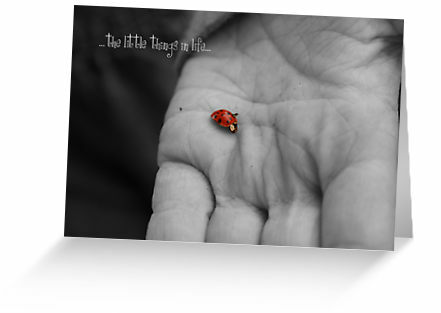 The little things, segue into the bigger things. Its like, when a building is being built…its the millions of bricks that fortify the structure into a tall skyscraper. I guess the little things aren’t so little.